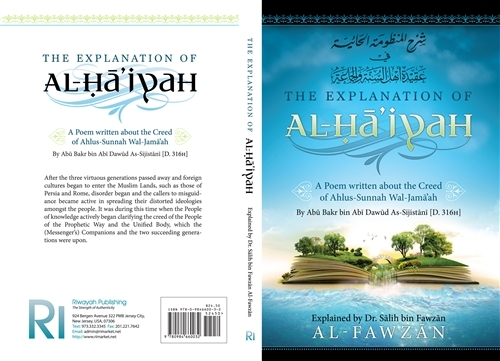 This is the highly beneficial English translation of Dr. Salih Al-Fawzan’s Explanation of Al-Haaiyah, a classical poem written by Abu Bakr bin Abi Dawud As-Sijistani about the Creed of Ahl As-Sunnah. From the summarized explanation of our Sheikh Abdur-Razzaq ibn Abdil-Muhsin al-Badr, hafidhahumallah. Shaykh taught at the Masjid, University of Madina. have come from the Messenger of Allaah so you will be saved and earn reward. Since the Speech of Allaah, through its recitation, is made clear. As a testimony to the truth of what we say – a hadeeth that clarifies it. Without asking how, magnificent is the One God and most worthy of praise. But sadly some have went wrong and did not believe them, marring themselves. Were his two deputies of old, and then ‘Uthmaan, according to the most correct position. ‘Alee, the companion of goodness, through goodness he was successful. Aamir of Fihr, and Zubayr the praiseworthy. And in (Soorah) al-Fath are verses about the Companions, praising them. (25) And surely, the Messenger of Allaah will intercede for the creation. Surely, the Murji’ is joking about the religion (ie. not taking it seriously). Because of obedience it grows, and on the Scale it will outweigh (other things). Since the stance of the Messenger of Allaah is more befitting and comforting to the chest. Attacking the people of hadeeth and reviling them.